Yesterday I went to a comedy show with my boyfriend. I decided to wear my colourful pants again, as an attempt to enforce the snow to go away and get the sun to shine. At least, when we shot the outfit pictures it seemed to work! My boyfriend made my outfit pictures again. He’s really good at it. I had so many good pictures, that it took me forever to select my favorites! I recently received the earrings and bracelets from the webshop Oh So HIP. I wanted to get some rosé gold coloured jewelry for a while now. I really like how it’s just something different from the jewelry colours that I usually wear. So when I saw these infinity and hand cuff bracelets, I couldn’t wait to wear them together! They have a lot of other items in rosé gold as well! Well, off to the outfit! Je hebt een mooi figuurtje voor de broek! Leuk om te lezen dat je fan bent van Caro Emerald. Voor dat ik dat las moest ik al steeds aan haar denken bij je foto’s! Dat hoedje staat je echt heel leuk! En de print van de broek is ook mooi! Love this outfit so much, adorable! 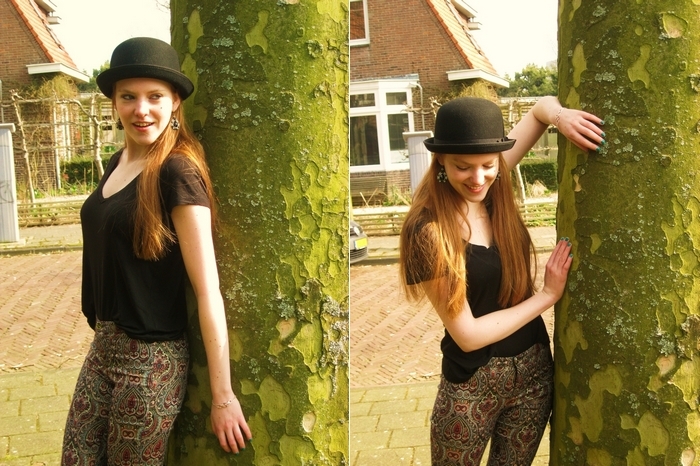 Hele leuke outfit, leuk printje heeft je broek! Praaaachtige jeans! Staat je écht enorm goed, Sonja. :( Voor de rest ook geweldige outfit!